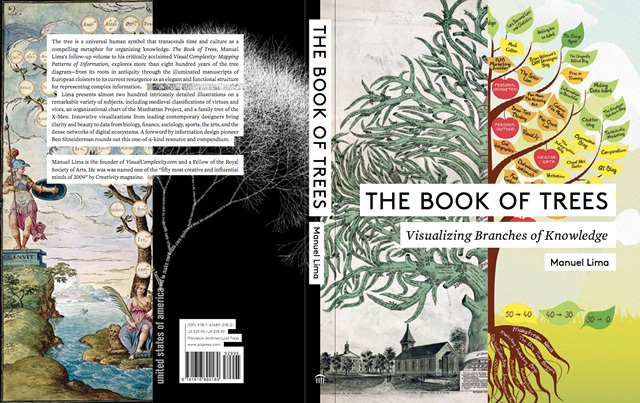 After many months of research, planning, and writing, I’m extremely happy to announce The Book of Trees: Visualizing Branches of Knowledge is now available for pre-order at Amazon (out by March 2014). While investigating various tree diagrams, charts, and illustrations for Chapter 1 of Visual Complexity: Mapping Patterns of Information, I became deeply obsessed with tree iconography. I remember being particularly enthralled with ancient figures from medieval Europe and three-thousand-year-old Assyrian stone carvings. During this research period, and despite my best efforts, I could never find a wide-ranging book dedicated to the tree as one of the most popular, captivating, and widespread visual archetypes. This was ultimately the crucial impetus that propelled me to create my latest work, The Book of Trees: Visualizing Branches of Knowledge. Trees are one of the most ubiquitous religious symbols across the world. From ancient Sumer to Christianity, from the Maya civilization to Buddhism, there’s hardly a human society over the ages that hasn’t associated trees with some sort of celestial and religious power. The omnipresence of such a revered symbol reveals an inherently human fascination with trees that goes well beyond sacred devotion. Due to its expressive quality and natural branching scheme, trees have also become important communication tools, illustrating a variety of topics such as family ties, moral values, systems of law, domains of science, biological species, hard disk drives, database schemas, and online discussions. As a direct embodiment of hierarchy and multiplicity, the allegorical tree figure has lasted hundreds of years as one of the most enduring archetypes in the history of visual communication. The Book of Trees covers over 800 years of human culture through the lens of the tree figure, from its entrenched roots in religious medieval exegesis to its contemporary, secular digital themes. With roughly 200 images the book offers a visual evolutionary history of this universal metaphor, showing us the incremental adoption of a stylized, abstract construct, as well as a recent emergence of new visual models, many employing advanced computer-generated algorithms. Ultimately, this book makes visualization a prism through which to observe the evolution of civilization. Pre-order now at Amazon and take advantage of the one-time special price.